There are many injustices, falsifications and cover-ups in our South African history that indeed has also had everlasting impacts on us, how we see ourselves and how others perceive us. Of all of these many stories there is one to which I return again and again because without recognition of this cover-up which stands out from the rest, the erroneous accredited foundation of our City of Cape Town and indeed modern South Africa will go on for perpetuity and with it an everlasting negative impact, particularly on descendants of indigenes in this region of South Africa. The story I refer to concerns two remarkable men whom the Europeans called Cary and Harry. Their real names were !Xhore and Autshumao and both originated out of the Goringhaiqua, a Peninsula based Khoena clan which settled on the banks of the //Gam i Ssa river (Camissa – sweet water/ Cape Town) in Table Bay, on the Cape Peninsula (//Hu !Gaeb). Both men contributed to the emergence of a new clan of maroon Khoena which became known as the Goringhaicona (!Kuinj//ai /kona). The name Goringhaicona meant the “children of the Goringhaiqua” and these were made up of entrepreneurial drifters and members of other clans – Gorachouqua (!Korakhwekwa), Goringhaiqua (!Kurinj//aikwa) and , Cochouqua (!Kukhwekwa) who for various reasons had branched off from other clans or suffered misfortune resulting in displacement or who were exiles from those clans. The Dutch had earlier labelled the Goringhaicona as the ‘Watermans’ (guardians of the freshwater //Gam I Ssa supplied to European ships) and then began using the first of the terms that blotted out their history, namely ‘Strandloopers’. The story of how this //Gam I Ssa settlement of Goringhaicona came about is quite remarkable and indeed is the true story of the foundation of Cape Town, before the arrival of van Riebeeck in 1652. Though it has always been a very well documented story, it was covered up by constructed falsehoods and replaced by the story of the so-called Dutch founder of Cape Town, Jan van Riebeeck. This story was later dramatized and romanticised by visual misrepresentations of Jan van Riebeeck and his wife Maria de la Quellerie using the images of two unrelated Dutch figures , Bartholomeus Vermuyden and the woman said to have been his mistress Catharina Kettingh (These can be seen at the Rijksmuseum in Amsterdam as can be seen the portrait of the real Jan van Riebeeck). I have on a previous occasion told the true story of Jan van Riebeeck, the disgraced VOC official caught out defrauding the company while serving in Hanoi (Tonkin) in Vietnam and Deshima in Japan. On his voyage of disgrace he passed the Cape of Good Hope and noticed that instead of any European power controlling this halfway shipping refreshment station, it was instead in the hands of local indigenes. He used this fact and the offering of his services to pioneer the establishment of Dutch control of the Cape refreshment station to redeem his honour. It thus came to pass that he wrested control of the trading station from the indigene Gorighaicona traders. The real story of !Xhore and Autshumao – Cary and Harry, should be a red-letter or prominent story in history if only for the fact that these are the first recorded South African indigenes to have travelled to London and Jakarta and back in 1613 and 1630 respectively. The facts of these cases challenge the false story that speaks of ‘Harry the Strandlooper’ – a troublesome ignorant scavenging beach-bum of no real significance. There had been regular shipping first by Chinese explorers dating back to at least 1421 and European shipping since 1488 that passed through Table Bay. By 1652 local indigenes hardly raised an eyebrow in their interactions with Europeans as they already had 200 years of engagement with peoples from beyond their shores. There was nothing magical about 1652. Up until 1590 relations were particularly precarious with the Portuguese due to the dramatic defeat and killing of Portugal’s greatest military commander and much of his army in 1510 by indigene Khoena when the Portuguese tried to teach the Khoena a lesson for daring to punish some Portuguese thieves. From 1590 and for the next 62 years a brisk trade was carried out between a range of Europeans directly with the indigene Khoena at Table Bay. By the end of the 1590s Portugal’s dominance was overturned in the Eastern trade with the United Netherlands States, England and France making major inroads. The Dutch quickly took the lead by establishing the first powerful multinational company the United Dutch East India Company (VOC) and England, ever the rival, followed suit with the establishment of the English East India Company. By 1605 there were 25 Dutch ships alone, not counting the Portuguese, French or English vessels, stopping at Table Bay to trade for fresh provisions with the Khoena. First Iron was the main exchange for salt, water, meat (sheep and cattle), and hides, but this quickly changed first to copper and later to brass. Various documentation resources record the various rises and falls and rises of this economy and who the key roleplayers in this were. It is in 1613 that the records first introduce us to the man who changed the face of trading with the Europeans – Cary (!Xhore) and introduced the modern economic foundations for what would become the City of Cape Town. In 1630 the records first introduce us to Harry (Autshumao) who established the first physical human and trading station in Table Bay at //Gam i Ssa which became the human and built environment foundation of Cape Town. In !Xhore’s case it was in 1613 that he was kidnapped and taken to London and returned to the Cape over a year later. In 1630 Autshumao it would seem of his own volition travelled with the English to Jakarta and back. The English East India Company ship the Hector kidnapped !Xhore and another Khoena man in May 1613. The companion of !Xhore died at sea but he was delivered to Sir Thomas Smythe of the EEIC whose intention was to train !Xhore and return him to Table Bay to act as an intermediary to support trading with EEIC shipping. The experience of !Xhore in London was a torrid one for him and the full account can be read in “King of the Hottentots” by John Cope (1967). On being returned to the Cape with what was seen by the English as “a small treasure” in June 1614, !Xhore established himself defensively inland and used his experience to his and his people’s advantage. A year later an English Fleet arrived under King James 1 envoy Sir Thomas Rowe who landed a party of settlers made up of released convicts from Newgate Prison under Captains Crosse and Peyton and the 19 Convict Settlers to establish an English Colony. !Xhore initially attempted to establish a mutually beneficial alliance with these ill-disciplined riff-raff but soon the Khoena and Convict Settlers clashed as they engaged in abuse of their indigene hosts. Notably there were no women amongst the settlers who quickly and indiscriminately in terms of status of relationships in the indigene community sought out Khoena women. 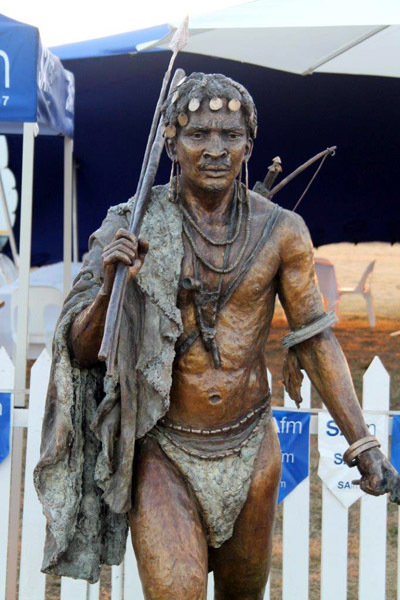 Xhore who had an armed force of 1000 chased off the Newgate survivors of the conflict who took to longboats and sought refuge on Robben Island. Only three made it back to England 3 years later, were reconvicted and hanged on Newgate Gallows. !Xhore was wary of the Dutch and although he generally traded with all the European powers was more consistent in his trade with the English. In 1626 he refused to assist the Dutch who visited in large numbers of vessels that year while he generously service English ships. It was in that year that a Welsh sailor recorded that “Cary who had been in England had been killed by Dutch mariners because he refused them food”. It was also noted that the reason Cary refused to assist the Dutch was “because of their ill-treatment of the blacks”. !Xhore’s abduction and return to the Cape actually backfired on the English and the Europeans as a whole. The indigene Khoena came to really understand the value of their livestock and also realised that they had been making a mistake in providing livestock to ships in such generous numbers as they had done before 1613. Never again did the Khoena part with so easily and in such large numbers their sheep and cattle even although !Xhore’s own herd was 5000 strong. After Chief !Xhore’s demise for the next five years there was a dip in relations and trade between the Europeans and the indigene Khoena. Then at the end of 1630 the English befriended a young cattleless marooned Khoena man by the name of Autshumao whom they called Harry. They put a proposition to him that they needed local people who could act as go-between trader agents between passing English ships and the inland Cochoqua who were said to have over 10 000 head of cattle and other resources. As part of the proposition that Autshumao accepted he travelled with the English to Jakarta – the Dutch VOC controlled centre of Batavia in Indonesia. In Batavia where he stayed for a year Autshumao’s linguistic skills improved in leaps and bounds and he learnt much about the Europeans – English, Dutch and French. On his return Autshumao who the English called Harry convinced the English that they transfer himself and 20 of his followers together with sheep, to Robben Island where he would be able to set up a safe trading station. In 1633 Autshumao convinced the Dutch to bring another 30 of his followers over. It is this group of 50 maroons from the different clans under Chief Autshumao who established the Goringhaicona clan who founded the first trading station at the Cape. Here on Robben Island they created lookouts for the ships and set up rudimentary light-house fires to guide the ships, offered a postal service and set up guides for carrying out negotiations for cattle, collected salt and water on the mainland. Autshumao at this stage mainly saw the English and the Dutch as his clients and warned off the French. He quickly learnt about the antagonisms between the different Europeans. Later he tried to use his very good relations with the English to his advantage against the Dutch. The Dutch in 1642 wanted someone who was closer to themselves than the English so they then transported an indigene Khoena man by the name of Isaac to Batavia to train him as their point man. The Dutch point-man did not last long. Isaac disappeared from any record within two years. Over the next decade, in the shadow of Table mountain, Autshumao or Harry, who was no ignorant beach-bum, armed with his mastering of languages and his first hand understanding of the Europeans and their ways from his year in Jakarta, as well as the expertise that he had gained over five years in European shipping movements and needs now built up a really good trading business supported by 60 -80 inhabitants of his trading station who could provide for every requirement by the visiting Europeans. Now English, Dutch, French and Portuguese used his services. He was an entrepreneur extraordinaire. By 1639 Autshumao and his followers had asked to all be returned to the mainland and set up their permanent settlement on the banks of the //Gami I Ssa river, a stone’s throw from where the Castle stands today. Twelve years later it was this well established trading settlement, with its rudimentary built environment that played host to Jan van Riebeeck and his men during a harsh winter while he built the first fort. It was little wonder that after 17 years of effort to build up a thriving business and settlement, and after warmly receiving Jan van Riebeeck and giving them hospitality at the settlement, that Autshumao was angered (as recorded by van Riebeeck who contray to the earlier advice of Commander Jansens chose to cut out the Khoena traders and deal directly with inland chiefs) by the turn of events. Autshumao was now experiencing having his trading business and village stolen from under him and being cast in the role of a beach-bum scavenger. Autshumao had forewarning about what could happen after the wrecking of the Haarlem when the Dutch survivors built a fragile Fort and remained for a year. The Commander of that Fort, Leendert Jansens was the co-author of the “Remonstrance” to the VOC Chamber of Seventeen which preceded Jan van Riebeeck’s “making himself available” after the first choice of the VOC no longer wished to go the Cape. Unlike Jansens well argued good-neighbourliness policy around Dutch-Khoena relations and respect for the Khoena as livestock farmers and traders to whom a fair price should be paid, van Riebeeck’s approach was to strip Autshumao of his dignity and employed a dispossession course of action. During Jansens year long stay at the Cape he had nothing but praise and good things to say about the Khoena traders. Jan van Riebeeck took a completely different approach, villified Autshumao and, the descendants of the Dutch settlement completely airbrushed out of the history books the founding Camissa Trading Settlement established by indigenes. Jan van Riebeeck took into his household as a servant, my 9th Great Grandmother, Krotoa also known as Eva at the age of ten. She was Chief Autshumao’s niece and over her short life (she died 21 years later) she acted as a translator, emissary and diplomat between the Dutch community in the Fort and the various Khoena clans. In Jan van Riebeeck’s Journal she is mentioned over 155 times and he owes much of his recorded understanding of the Khoena, their customs, communities, the names and characteristics of their leaders, their economy, language and heritage to this young woman whom that settler community used and abused. Cape Town was thus not founded by the crooked, errant and transient Dutch Commander from Vietnam infamy (who only stayed for a decade), – he simply was the pioneering founder of the Dutch colonial settlement . The village, that became a town, which became the City of Cape Town was founded by that entrepreneurial, Jakarta-trained trader Autshumao. He too, on the building blocks laid by Chief !Xhore who had been trained in London, established the basic sea-port trading economy and hospitality economy that Cape Town still has as its main characteristics today. !Xhore too was the father of the agricultural trading economy. But the memory of this greatness is still denied to his descendants today and he is still referred to as that scoundrel beach-bum. Stop awhile and remember CARY & HARRY – Chiefs !Xhore and Autshumao and the true story of the founding of Cape Town. Many make the mistake to simply an inaccurately depict the Khoena and San as landless wandering groups of primitive stone and ironage people with no fixed abode and a single form of economic activity. Modern history did not leave the Khoena and San behind. The South African museums and social anthropologists have always depicted the various people of South Africa before 1652 as primitives without civilisation and with no social history. Thus one can go to no museum that will tell you the names, dynasties, kingdoms, economies and stories of the Khoena, San, Nguni, Bakoni, Tswana, Sotho and other families of peoples in our country. Something needs to be done urgently about this. History did not start in 1652. You can read Richard Elphick’s “KhoiKhoi and the Founding of White South Africa” (1985) and John Cope’s “The King of the Hottentots” (1967) two amongst many other works that will if read carefully and with an open mind give you a very different perspective on the beginnings of the social and economic development and the built environment of Cape Town that is most often simply ascribed to superior European abilities.